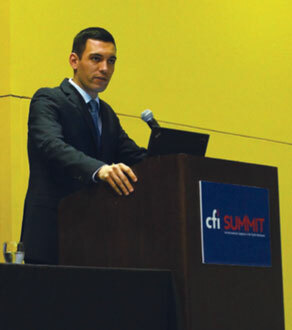 It was billed as the CFI Summit—An International Congress in the Pacific Northwest, and it was a kind of experiment. “The time has come: humanists, skeptics, and other critical thinkers coming together to work together for a more rational world.” That was the meeting’s call to action, as the first joint conference of the Center for Inquiry and its affiliate organizations, the Committee for Skeptical Inquiry (CSI, publisher of the Skeptical Inquirer) and the Council for Secular Humanism (CSH, publisher of Free Inquiry), convened in a stylish, modernist hotel in Tacoma, Washington, October 24–27, 2013. The conference thus included/subsumed what otherwise CSI would have called CSICon 3, following the first CSICon in New Orleans in 2011 and CSICon 2 in Nashville in 2012. The weather outside was foggy, though the talk inside was anything but, as skeptic and humanist speakers explored all the areas in which their interests and passions overlap, and a few that some may (and others may not) wish to keep separate. We offer two reports. SI Editor Kendrick Frazier highlights several representative sessions1 that may be of particular interest to SI readers, and skeptic Susan Gerbic offers a more personal, impressionistic account of the conference. 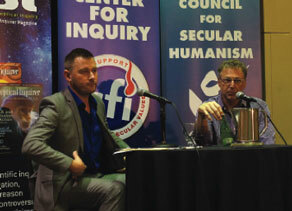 The opening plenary session, “Humanism, Skepticism, and Inquiry,” was a theme of much of the conference and the point of continuing discussion throughout. 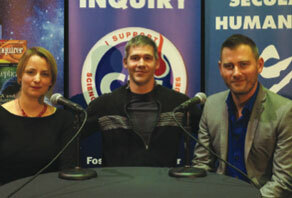 Is it about time the two major arms of the Center for Inquiry—skeptics with their love of science and evidence-based inquiry and humanists with their naturalistic philosophy and distrust of religious intrusions in public life—come together, at least once a year, in a conference like this? Or are there still good reasons that the two groups keep their own separate conferences? If you drew two circles representing the interests and values of members of the two groups, they’d probably overlap by about two-thirds or three-fourths. that religion should not have a privileged place in society exempt from critical scrutiny. 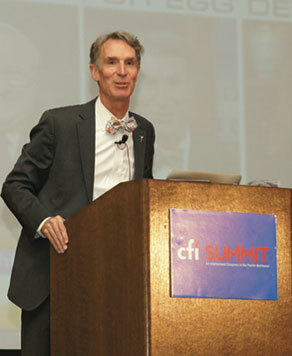 large constituency of millions of young people is emerging” favorable to the viewpoints of CFI. another in a more or less seamless way. publishers have resisted so far,” said Koplin, but he wasn’t sure whether their resistance would continue to succeed. to creationist schools. He said $4 million of public money was taken away that way the first year. Nye’s was a rousing talk, roaming over how we determined the age of the Earth at 4.6 billion years (“Why then try to pretend the Earth is 10,000 years old? to gain so much influence actually operating in public schools. These two interviews are online at www.pointofinquiry.org. Breakout session I moderated on “Skeptical Investigation and Activism” (Joe Nickell, Benjamin Radford, James Underdown, and Susan Gerbic).